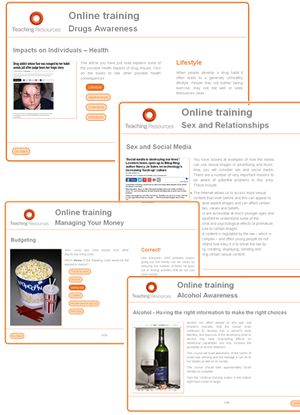 The brand new online training modules available from Teaching Resource Support offer teachers a more flexible approach to introducing students to the topics of SRE, finance, drugs and alcohol. The online training modules have been developed by ASTs and PSHE experts and modified into online modules by experienced educational author, Steve Martin. Each of the courses can be delivered via web link for individual completion or presented in the classroom as a group activity. The bespoke distribution tool allows you to track and monitor your training exercises. Young people are increasingly turning to the Internet and social media for sources of information about a huge range of topics. However, this can have damaging effects when it is used for information about SRE. This SRE module helps to inform students about the potential for finding false and misleading information from these sources. This training module is designed to help young people appreciate the concept of ‘money’. We explore the issues of paying for things – that everything has a price, and we need to accumulate enough money to obtain these items and budget accordingly. Having the right information to make the right choices. In this KS4 training module, we think about illegal substance abuse and learn about the law in relation to drugs as well as sources of further advice both inside and outside school. Alcohol can affect people of any age, but research indicates that the human brain continues to develop into a person's early twenties, and exposure of the developing brain to alcohol may have long-lasting effects on intellectual capabilities and may increase the possibility of alcohol addiction. This course will build awareness of the harms of under-age drinking and the damage it can do to our bodies as well as on society. These training modules are available to Premium Plus members - join now!